Visitors to Disney's Hollywood Studios at the Walt Disney World Resort have a number of opportunities to be immersed into the world of Star Wars fanfare. For my little Jedi, we made Star Wars Launch Bay one of our first stops during the day. 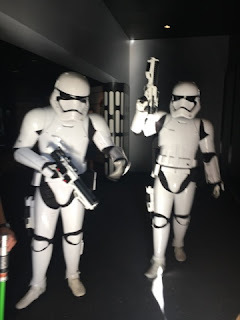 My son was dressed as a Jedi for our Halloween visit to Hollywood Studios and was heavily questioned at the entrance to Star Wars Launch Bay by the Stormtroopers guarding the entrance. Once inside, we opted to move past the Launch Bay Theater where a short film plays giving behind-the-scenes information about the Star Wars saga and linking together some memorable clips. 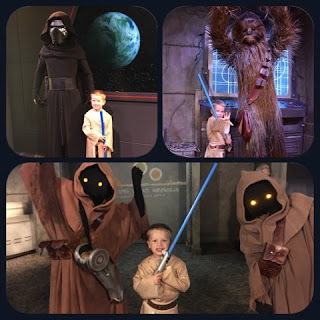 At 4 years old, Brody was focused on meeting the characters so away we went! At Star Wars Launch Bay, you are able to meet Chewbacca and Kylo Ren. The characters are separated into two queue lines with pieces of Star Wars memorabilia for you to look at while you wait. We first visited Kylo Ren, which made Brody a little nervous the closer we got. He was worried that Kylo Ren wouldn't like him because he fights for the Dark Side while Brody is a Jedi and clearly on the Light Side. I will say, that when the doors opened and we had our chance to meet Kylo Ren, he was a little intimidating. He paces in front of the group, presumptively trying to use the Force to read our minds. 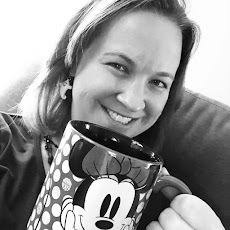 There really is nothing "scary" about the encounter - but it's definitely a change for the "warm, fuzzy" character meets you might be used to around the parks. Then he poses for a quick picture before you are ushered out. We waited about another 20 minutes in the next queue line to meet Chewbacca. Chewie could not have been more friendly! He had lots of hugs for the whole family. After about 50 minutes inside meeting characters, we were anxious to move onto the next adventure in our day. We quickly moved through the remainder of Launch Bay where there were computer games, more memorabilia from the Star Wars saga, and even a chance to visit with some Jawas. Launch Bay is a great stop in Hollywood Studios for Star Wars fans young and old alike. It's also a great place to escape the heat during your day in the park. And Launch Bay continues to receive updates! On Monday night, Walt Disney World announced that new pieces - both authentic and replicas - from Rogue One: A Star Wars Story will be added to the Launch Bay experience, which means that even the seasoned Walt Disney World traveler will have something new to check out on their next visit!